You may be familiar with Plasq. They've brought us applications like Skitch and Doozla. But before those applications existed they had a very successful application called "Comic Life". The first iteration of Comic Life gave you comic book formatted pages in which you could drop your pictures or artwork and add talking bubbles. In essence, it allowed you to produce your own electronic comic books. I first heard of it when it shipped on my daughter's iMac. 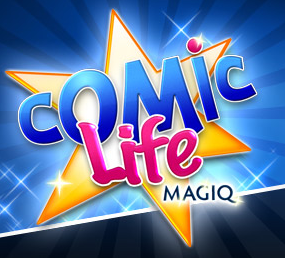 Plasq has now reinvented Comic Life with the recent release of Comic Life Magiq. This new release represents a significant interface and feature upgrade over the original Comic Life. Booting up Comic Life Magiq, you are presented with a series of potential themes. Of note here is that these themes are not all comic book related. They have themes like "road trip", "memories", and "birthday". In other words, the folks at Plasq figured out what we were all using the application for and have embraced it. Of course, if you don't want a ready-made theme, you can make your own. It will be curious to see if web sites start sprouting up devoted to sharing Magiq themes. Once you load up your theme, there is an updated but somewhat familiar Comic Life interface that allows you to start dropping your pictures and artwork into the template. One nice feature is that in addition to your iSight camera and iPhoto album, Comic Life Magiq can browse your Aperture library. It is all very easy to comprehend and without cracking the manual you'll find yourself changing the layout and otherwise modifying pages an options in no time. The text effects are also fun with a variety of comic friendly and not-so-comic-friendly fonts to choose from that can be dropped into any one of several included bubbles or simply drawn across the page. While these features represent a welcome update to a very fine application, the most notable new feature in Magiq is the image editor. Plasq has joined a growing list of OS X developers dabbling image editing. Actually the term "dabbling" really doesn't do this effort justice. The Magiq image editor is quite powerful with different layers, each of which can be easily reset. The Color layer gives a variety of common photo editing tools such as sharpen, exposure, hue, and crop. The next layer has a very easy set of tools to do a more than average job of removing an image from a background. The method, which requires two sets of rough outlines on the area to be removed and the area to be kept is very intuitive and consumer friendly. As an example, my eleven year old probably has no interest in learning photoshop, but in Comic Book Magiq she was all over this tool. The next layer allows you to warp objects with a variety of familiar tools from the OS X core image assets such as pinch, bulge, twirl, and squeeze. If that isn't enough there are additional layers to allow you to put an overlay on the image and filter the effects, such as blur on the image. Finally, there is a paint brush that allows you to draw in what could not be accomplished in prior layers. While most of these tools were intuitive to lear, others took some experimentation to figure out. I think some degree of complexity is inevitable with this many tools. Once your masterpiece is done you print or export it in a variety of formats including FLickr, HTML, PDF, and iWeb. Comic Life Magiq requires Mac OSX 10.5 Leopard and reliant on some of the Leopard tricks. Strangely, Magiq can not read older Comic Life files. I hope the developer releases a conversion tool or adds this functionality to a later release. The inclusion of the robust photo editor really transforms Comic Life Magiq into a significant upgrade over its predecessor. It gives you one application to create the layout and do the photo edits. This seems to be just one more example of convergence in OS X software. There are videos and a trial download at Plasq.com. If you are looking for a fun way to present photos, go take a look. Comic Life Magiq can be purchased from Plasq directly for $44.95 for a full version or $29.95 for a cross-grade from Comic Life. They also have a limited time introductory $5 discount for the early adopters.